Capt. Joseph Sanders is meshing education with his military career. Sanders, of Waverly, is part of an increasing trend of active-duty military personnel pursuing advanced degrees as part of the U.S. Army’s Advanced Civil Schooling program. Sanders will graduate in December with a Master of Business Administration. 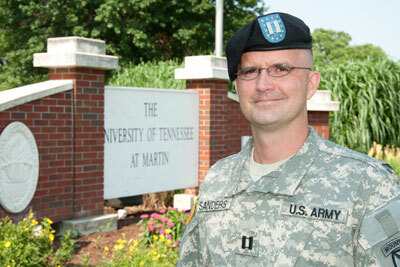 Sanders was assigned to UT Martin, his alma mater, to gain the advanced degree, after earning his bachelor’s degree in 2001 and, as a culmination of ROTC, being commissioned as a second lieutenant in the U.S Army. He has a total of 14 years of active duty. Additionally, he is a graduate of the U.S. Army Infantry Officer Basic Course and the Military Intelligence Captains Career Course. Sanders always intended to make military service his career, stationed after college at Vilseck, Germany, as part of the 2-2 Infantry Battalion. He’s since served in the Middle East for a total of 39 months. He was deployed to Iraq in 2004 and remained for 12 months and again in 2006-07 for 15 months. He was deployed for 12 months in 2009 to Afghanistan. His specific assignments have included: electronics technician, U.S.S. Lake Champlain CG-57 at San Diego, Calif.; platoon leader, 1-63rd Armor Battalion at Vilseck, Germany, to include deployment to Iraq in support of OIF II; assistant intelligence officer, 1-26 Infantry Battalion, Schweinfurt, Germany, to include deployment to Iraq in support of OIF 06-08; Intelligence Officer, 3-71 Cavalry Squadron, Fort Drum, N.Y., to include deployment to Afghanistan in support of OEF 09. Awards include the Bronze Star Medal, the Meritorious Service Medal, the Army Commendation Medal with three oak leaf clusters, the Army Achievement Medal with one oak leaf cluster, Combat Infantryman Badge and the Expert Infantryman Badge. Recently, Sanders was selected as the speaker for the annual Memorial Day observance on campus this year. 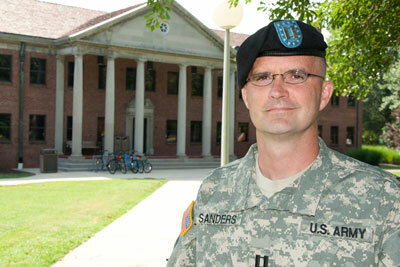 After receiving his MBA in December, Sanders will be reassigned based on Army needs. He is engaged to Capt. Kristina Stokes, U.S. Army officer, and they plan to marry in spring of 2012.